The Jord Wood Watches are indeed gorgeous and unique. I have wanted one of these watches for a very long time and will have to share this post and giveaway with my other family members. I love the giveaway and the $20 voucher for everyone that enters. Thanks for sharing the review and giveaway. I’ve seen these and they are truly unique and beautiful watches. I like how they are sturdy, practical and still make a great fashion accessory. That is such a cool design. I really like the color of the face and the wood is so pretty. What a cool design! My son has a wood watch but it isn’t square. That is really unique. I have always wanted one of these Jord wood watches. They look so cool and fun. Thanks for the giveaway. That is such a unique watch. It would be perfect for someone that works in wood working. My husband is so picky with his watch he will only use a rubber band, but my dad would love this. That is such a neat watch, they are always my favorite accessories! I love that it is wooden! JORD watches are so stylish. I like the dark wood, because it’s perfect for fall and winter. I’ve heard great things about the Jord watch. I’m actually looking for a new watch and this one sounds like a great option. Thanks for sharing your experience. What a gorgeous watch. I love how many different options and styles JORD Offers. This is a unique gift as I have never seen a wooden watch before. I own a couple of JORD watches and love them! Yours looks really nice. Great giveaway. 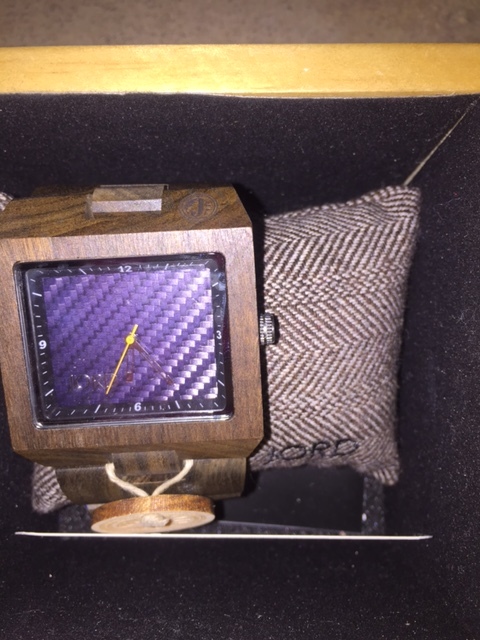 I love JORD watches and I cant believe they can make a watch out of wood. They are so stylish and fun to wear. What a cool design and I love watches that you would not see in stores! Pretty cool!! Wow, what a beautiful watch. This would make a great Christmas present for parents and spouses. Great watch options though I feel in these days that people no longer wear watches. They are nIce though. I love wood accessories and JORD watches look like they would be PERFECT for me. Such lovely details and beautiful wood! I’ve heard a lot of great things about JORD wood watches. I’m entering the giveaway, I would love to have a new watch! My husband has one of these watches. He loves it and wears it when we go out to dinner. The wood looks really nice on it. I’m such a fan of the Jord brand. Wooden watches were new to me but I fell in love. Great design choice. JORD has always given us great choices for wood watches. I recently got my first and I am loving it! My husband has one too. I love the dark sandalwood of this watch you featured in this post. Who knows I might be ready for a second Jord watch! I really like this brand because they have amazing watches! Everything just looks really gorgeous and it’s definitely something that you’ll want as your accessory. Thanks for the giveaway! Looks like these would be a a great gift at holiday time! This is a gorgeous watch!! These would be a great gift around around Christmas time!